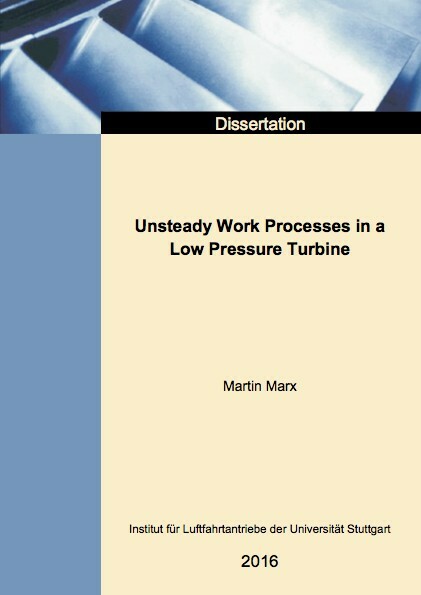 In this thesis, the unsteady turbine work and the underlying physical processes are analyzed. Methods are developed to validate and quantify the so-called wake differential work effect, an inviscid stator wake momentum recovery in subsequent turbine rotors due to unsteady work. If low-momentum wake fluid receives work through an unsteady, inviscid work mechanism, the momentum difference compared to the undisturbed free stream fluid is reduced, which offers a potential reduction in the overall mixing loss. In a combined experimental and numerical approach, the static pressure field of a two-stage low-pressure turbine is analyzed in order to isolate and investigate local unsteady work regions, which are responsible for the differential work in upstream originated wakes. Through a Lagrangian analysis, in which a large number of stator wake- and free stream particles are tracked through the subsequent turbine rotor, the existence of the wake differential work effect is verified on a statistically representative basis. With the Lagrangian method, on average a 14% elevated stagnation enthalpy of the stator wake fluid behind the first rotor is shown, which serves as a confirmation for the existence of the differential work effect. A simplified, inviscid, one-dimensional model is created, which expresses unsteady work as an interaction of fluid particles with propagating static pressure waves. Through this model, the thermodynamic response of the fluid particles on a static pressure increase or decrease is described, in terms of estimating the kinetic energy and static enthalpy change due to the pressure wave. In a final step, the developed pressure wave model is incorporated into a steady mixing sum, through which the influence of a differential work transfer between the two streams on the downstream mixing loss is approximated. It is concluded that a mixing loss reduction due to unsteady work effects is possible, but requires a work transfer region which is well-aligned in order to only transfer energy from the high-momentum free stream into the low-momentum wake. If this is not given, the unsteady work mechanism may act as significant loss source, instead. The research presented here is based on the ATRD turbine, a full-scale engine- representative turbine rig preserving both Mach and Reynolds number similarity. The turbine is installed and tested at the Altitude Test Facility at Stuttgart University.